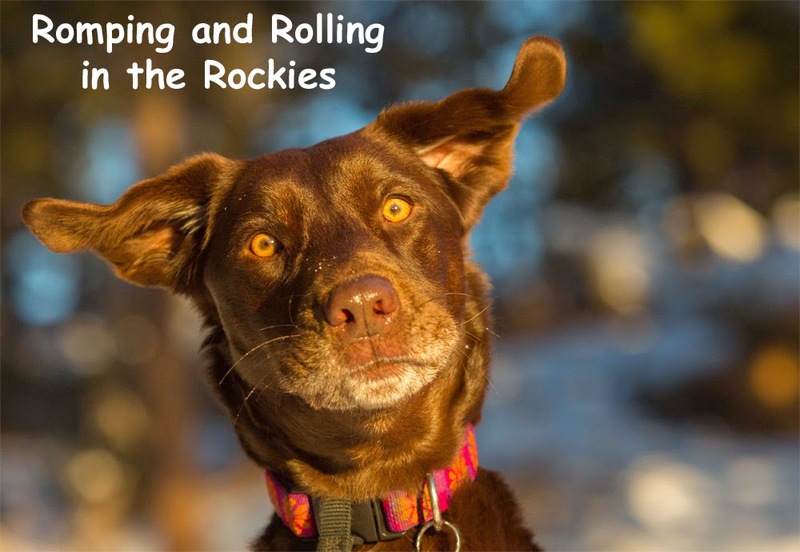 Romping and Rolling in the Rockies: The Bears are awake and active!!!!! 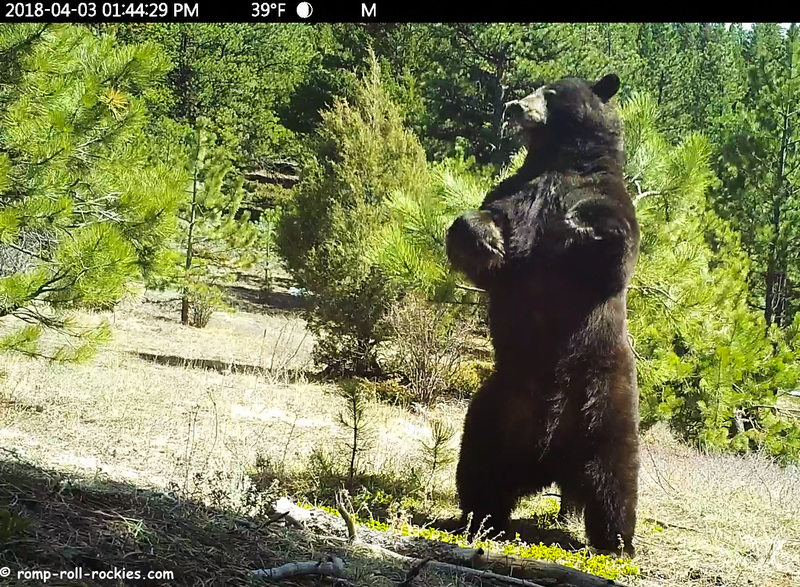 Those who have followed along for a few years know how excited I get when the bears reappear after a winter of resting in dens. Well, my favorite day of the year happened recently. A huge bear, who I believe is one of our biggest resident males, began to mark trees. He looked magnificent! I believe that he is "Tiny", the ironic name for our gnarliest bear. Tiny appeared to have an infected wound that slowed him considerably last summer so I am relieved to see him back. I've talked with bear biologists who tell me that it is not uncommon for bears to heal all their wounds while they rest in their dens. When he first appeared, Tiny marked the same tree FOUR times. 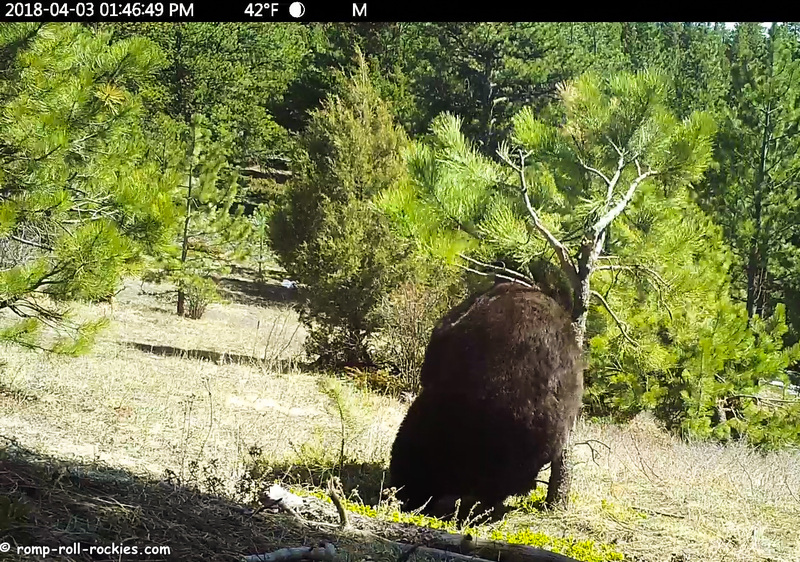 As you watch the video, you'll see that he started by leaning into the poor small tree with his considerable weight, as if he was about to fall asleep again. Then, each time, he'd rear up on his hind legs to rub his scent all over the tree. After repeating his marking four times, he departed but stopped at one more tree on his way out of this area that I think of as the "Banana Belt" because it melts out before other parts of our forest. 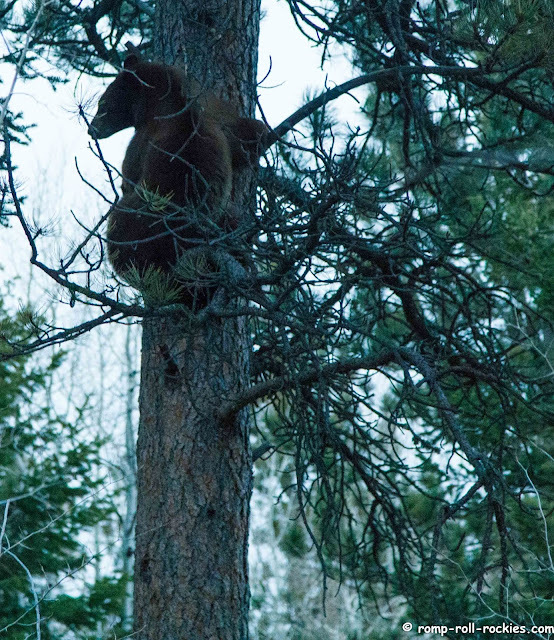 A few days later, a smaller male bear showed up first at the same tree that Tiny had marked multiple times. You can see how much thinner he is than Tiny - he still needs to bulk up to rival Tiny. This bear didn't dare mark over Tiny's scent. In fact, he seemed to deflate after smelling Tiny's scent (see photo above). However, he was very interested in my camera. 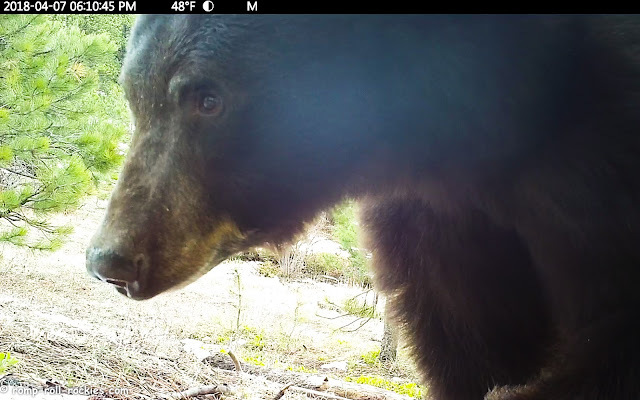 I believe it may be "Bandit", the bear who destroyed my trail camera last year. I am very lucky that he didn't attack the camera that he sniffed on 4/7. Then, Bandit went to the second tree that Tiny had marked. He sniffed it, looked upset, and then heard a sound from a distance. That was enough to make him bolt into the forest, probably out of fear that Tiny was around. Males fight fiercely for territory, and Bandit would definitely lose a fight with Tiny. 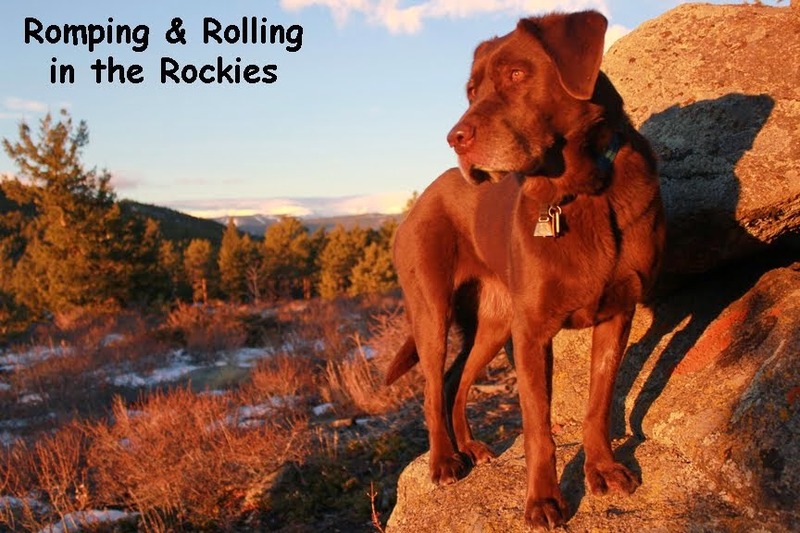 After all of that excitement had occurred a distance from our house, I was hiking with the dogs on leash one evening near our house. The dogs seemed extremely hyped about a scent in the air. I thought it was elk or a moose. We kept walking, and we almost walked up to a bear! R went insane (on leash), barking like a lunatic. 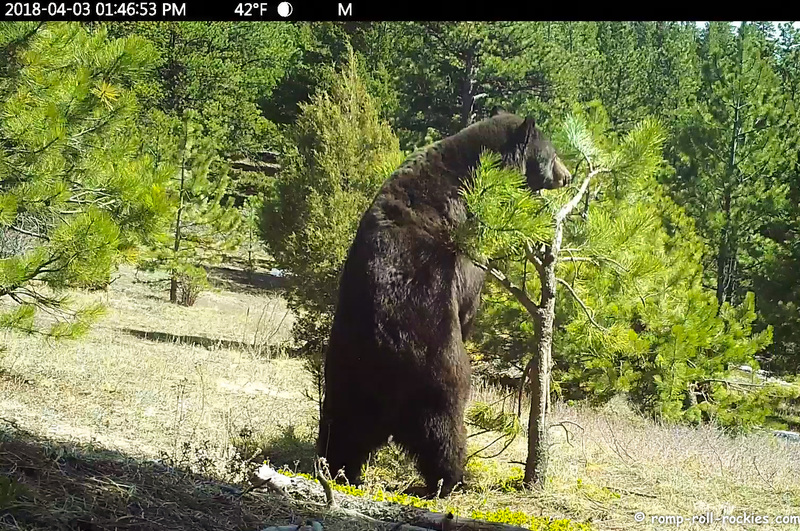 The bear went straight up a pine tree. He initially stopped about 20' up, making very mournful moaning noises because he was terrified of R's barking. I snapped a terrible photo in the dusky light and departed. I believe that it was Bandit but I'm not certain. We hiked in the other direction. However, at the end of our hike, we went past that tree again. The bear had gone higher in the tree. He was draped across a big limb with his human-like hind paws hanging down below the branch. It was too dark for a photo but it looked as if he'd taken a nap while he waited for it to be safe to descend. We headed home, and the bear was gone the next morning. I am overjoyed that the bears are out foraging in our forests. Life is so much more colorful when these characters are around! 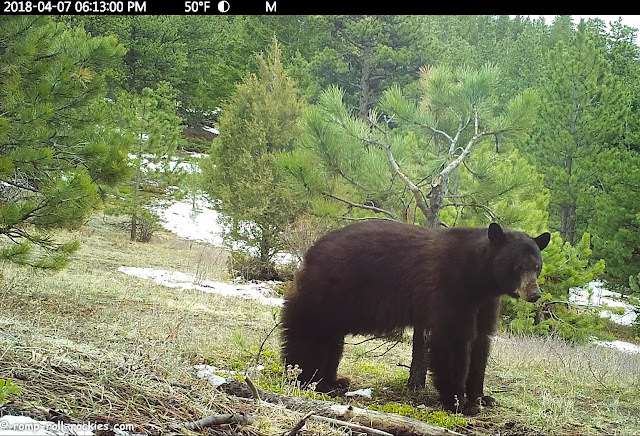 Enjoy my video of the first bears of the season either here or at Youtube! Ohhhhhhhhhhhhhhhhhh my BEARS...Good morning Tiny. Jumping catfish you are gorgeous and we feel so honored to have seen you in they great wide open being a great big beautiful Tiny bear. R we just read about your ultrasound scheduled for today. We send you kitty kisses and hugs for a good report and hugs to your peeps! Yeah for the bears!! That's too funny the little guy was sad about the scent on the tree. He just wants a girlfriend. OMD, Tiny is gorgeous! I'm sorry that Bandit got so skeered of R, but better that he ran off than try to charge you. your very first photo of TINY who is grossly misnamed, HA HA, has my heart singing with joy. he is just gorgeous and so much bigger than that tree. I am linking to this post in my post about straws tomorrow. who would want to put a bear like this in danger from plastic straws. i love todays post and it might be my favorite except all your post are my favorite . We're glad to see the bears back in action. Those bear marking trees always make us chuckle since they usually are barely a tree (or is that bearly?). The bears seem to stunt the trees growth since all that rubbing breaks off quite a few branches. Thank goodness that you choose sturdy trees to mark, Tiny. You were really putting a lean into it! Bless you for warning your mom and Shyla there was a bear too close for comfort, R! 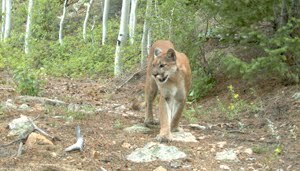 Oh my goodness We thought he was going to eat your trail camera. How great your bears a back. Tiny is huge and so healthy looking after his long sleep. And that's one tough tree. So cool. They don't even look real! I cannot imagine a bear being scared of R's bark, just as well he clambered up that tree so fast.They all look like their coats are thick and glossy, must have had a good store of food in their tummies before winter started so long ago. If that was Bandit, maybe he thought he could mark the trail cam tree instead, and a very noisy departure through the dry branches. What fun to watch them! I wouldn't love running into one in the woods though! I'd be happy to have a big dog like R to scare it off. I can imagine Luke would react the same way. WOW! They are HUGE! Beautiful, but HUGE!!! How fun to watch the first marking! Happy to hear that Tiny is OK! YAY!!!! WE LOVE the video. My husband and I watched it together. But we are very glad that bear went up the tree and not towards you. Oh yea, that is plenty awake and we love it! Great snaps!! And it's so good to think Tiny is back and doing well, I haven't seen bears here yet but they are probably up and about - or will be any minute. 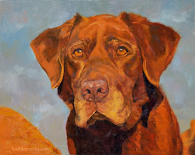 OMD, how amazin'!!!! I likes Bandit! I just wants to hug him ☺ Tiny is humongous!! what a manly man! BOL!!! Wow, that was wonderful to see. Thank you for sharing what you found. Once the bears are awake life is different. I always has them in my thoughts while wandering. Wow, amazing! Tiny is soooo gorgeous. What a shiny coat! Those bears, sure are awake! Wow!